Cairo (AINA) -- Clashes between Muslims and Christians erupted yesterday in the Al-Khosous district of Qaliubia province. According to reports, ten Coptic Christians and one Muslim were killed. The violence broke out after swastikas were drawn on the side of a mosque wall. The Muslims claimed the swastikas were drawn by Christian children, but the Qaliubia security forces manager, Mohamad Yousry , said it was two Muslim children who drew the swastikas and that the mosque Imam chided them. But some Christians and Muslims got involved in the incident and it escalated from there. He added that rumors of Christians drawing crosses on the mosque's walls were circulated by Muslims. Salafi Muslims began congregating in side streets near the Coptic Church of St. Georges. 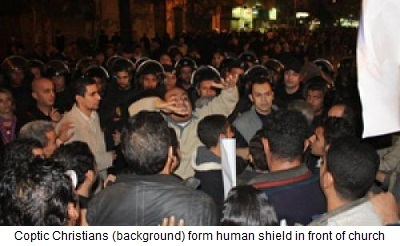 Christians formed a human shield to prevent them from approaching. Witnesses said the Muslims shot at the church and disappeared into the side streets. According to Father Sourial Younan, the priest of St. Georges Church, the Copts were killed in front of the church by gun shots. Pastors in Al-Khosous called several TV stations and NGOs early yesterday evening to express their fear that if this incidents was not confined it would spread to neighboring areas, including Ain Shams and Zoreibat. Father Younan warned of impending bloodshed. Father Younan said he was locked inside the church with another priest and 50 Copts and stayed inside until the early hours of today. "It was as if war had broken out. We peeped through the windows and saw Coptic youth slain in front of the church, and families carrying their wounded away." He criticized the police, who arrived two hours late, and security forces, who arrived 5 hours late. "Destruction and arson took place in the presence of police, who were unable to control the attack." He said that later there was an armored vehicle calling on inhabitants to stay in their homes so that they can deal with the terrorists. There was street fighting throughout the night (video). According to Coptic activists Nader Shoukry, these events were prompted by direct incitement from the neighboring Muslim religious institution, which belongs to Al-Azhar, to "purify the region of Christians." According to Father Younan, there was a feud between a Coptic family named Samir Iskandar and a Muslim family, which may have been the spark that caused the violence. He believes that what started yesterday's clashes was that Muslims from that family sexually harassed Coptic girls from the Iskandar family, which started the fight between them. "A fight between two families," said Father Younan, "what has this to do with the church?" But Many activists and politicians believe the incident was orchestrated by the regime to cover up the turmoil and demonstrations in the country. Mohamad Abu Hamed, a former MP, said "It is not possible that every time the regime wants to cover-up its failure, the Copts are attacked and their churches burned." Although the Governor and security forces claim everything is under control, Father Younan believes it is "the calm before the storm." It was reported that Christian families have started leaving Al-Khosour for fear of renewed clashes. Security forces said they are in the process of arranging a "reconciliation" meeting between the two parties, "during which the Copts are expected to give up all their rights as usual," Said Coptic activist Wagih Yacoub.